Key Message: This paper is an overview on diagnostic assessment and management of peripheral nerve sheath tumors in neurofibromatosis 1 based on the literature and the author's experience, as gained in over 20 years in practice. More than 500 mutations have been identified. With the sole exception of the so-called “microdeletion” [Table 1], equivalent to a loss of 1.5 MB and found in 5%–10% of cases,,, no correlation between a mutation and the phenotype has been found. The wide spectrum of clinical pictures associated with the same mutation suggests that other factors determine the phenotype, yet their nature has not been identified. NF1 is an age-penetrating, multisystem disorder; the nervous system is particularly affected. Peripheral nerve tumors (PNTs) are found in as many as 30% of cases.,,,, Manifesting in childhood, they mostly grow during adolescence (their volume increases more rapidly than body weight over time) and new tumors appear at an annual rate equal to 0.6. Clinically silent, deeply located lesions (e.g., pelvic or mediastinal masses) are discovered during diagnostic assessment [Figure 4] and [Figure 5]. They occasionally grow, becoming symptomatic due to compression on the surrounding structures (e.g., dyspnea in mediastinal lesions). These presentations relate to a variety of benign, malignant, and pathognomonic clinicopathological entities,,,,, presenting peculiarities in comparison with sporadic forms. Benign tumors include schwannomas, neurofibromas, and the pathognomonic plexiform neurofibromas. Schwannomas are the most common histotypes in the general population (the schwannoma/neurofibroma ratio is 9:1), whereas neurofibromas largely prevail in NF1 (the schwannoma/neurofibroma ratio is reversed to 1:9). Plexiform neurofibromas (PNs) [Figure 2] and [Figure 3] are a variant found in 30%–43% of NF1 patients and considered pathognomonic of the disorder [Table 2]. The term “plexiform” (from the Latin “plectere” meaning interweave) refers to their histological appearance like a network; they diffusely grow along the nerves and plexuses [Figure 2] and [Figure 3], appearing as deforming, multinodular masses often involving connective tissue, and often being associated with skin folds. The management of PNTs is a well-recognized priority in NF1, especially the focused prevention of occurrence of its malignant forms. This paper is aimed at offering a comprehensive overview on the diagnostic assessment and management of PNTs in NF1, based on the literature review and the author's experience, gained in over 20 years in surgical practice. The clinical diagnosis of NF1 is based on the criteria listed in [Table 2] and must be confirmed by a genetic analysis. A thorough assessment is necessary to estimate the entire burden of the disorder [Table 3]. Follow-up visits of the patient are regularly scheduled. PNTs are easily detected on clinical examination, when they are superficial and of a large enough size. Ultrasound is an excellent tool for detecting small/medium-sized tumors along the limbs, and also deeply located abdominal masses, whose diagnostic workup is then completed with the performance of a contrast magnetic resonance imaging (MRI) study. Diagnostic assessment also includes fluoro-2-deoxy-D-glucose PET/[CT] (FDG –PET/CT) when we suspect malignancy in a deeply located, bulky lesion (diameter > 6 cm), before considering surgical indication. We recommend surgery in symptomatic tumors, in lesions with radiological evidence of malignancy and in bulky masses (diameter >6 cm). Surgery is performed under general anesthesia, with direct nerve stimulation and under magnified vision (surgical loupes are used during the exposure and a microscope is utilized during tumor removal). Small or transverse incisions are not appropriate as complete visualization of the neoplasm and its nerve of origin (including the proximal and distal healthy parts of its trunk) is essential. Exposure of PNTs along the limbs and in the brachial plexus is easily achieved; deeply located tumors often require a multidisciplinary approach. Once exposed, the tumor is inspected under the microscope, in an attempt to locate a fascicle/functionally-free area on its surface with nerve stimulation. The removal of the tumor continuously hinges on continued electrical stimulation of the nerve to identify and preserve the functioning nerve fibers while attempting preferably, if possible, an en bloc resection of the tumor. Possibilities of radical excision depend on the histopathology of the tumor. In schwannomas, radical removal is always possible; they appear as well-circumscribed, solid masses (occasionally presenting with a cystic component) with an eccentric growth, with nerve fibers running on their surface [Figure 6]. The latter can be usually be easily identified and preserved. Neurofibromas appear as fusiform expansions of a nerve trunk and the nerve fibers are often dispersed within the tumoral mass [Figure 6]. When nerve stimulation reveals functional fascicles embedded within the tumor, pursuing radicality of excision is associated with the danger of developing postoperative neurological deficits; considering its benign nature, our strategy is to debulk the tumor in order to relieve the symptoms, while preserving the function of the parent nerve. Removal of plexiform neurofibromas also complies with these general principles. Some plexiform neurofibromas are inoperable [Figure 2] and [Figure 3]. In the other cases, based on the morphology of the tumor, surgery results in gross tumor debulking; radical removal should only be attempted if it is not at the expense of developing new neurological deficits. In tumors that are associated with a disfiguring growth, removal is performed in a multi-staged manner, as a single attempt usually results in a remarkable blood loss. As it does not result from major feeders, this insidious bleeding may be underestimated and not timely compensated for during the procedure, until signs of severe, acute anemia and hypovolemia manifest. This may affect the postoperative course, especially in children. To prevent a postoperative hematoma formation in the tumor bed, subcutaneous drains should preferably be inserted following excision of these lesions and removed after 2–3 postoperative days. The skin over the plexiform tumors is often particularly thin (due to reduction of the dermal layer); thus, healing by a secondary intention is frequent. In NF1, MPNSTs, when not associated with neurological deficits, are often morphologically indistinguishable from the benign forms; at surgery, they appear like well-capsulated tumors respecting the nerve anatomy and the surrounding tissues, and can often be radically removed preserving their structure. A clinical presentation of excruciating pain, a rapid tumoral growth, and an early onset of neurological deficits is always associated with infiltrative tumors. At surgery, these lesions appear as an asymmetrical enlargement of the nerve trunk, frequently presenting with stone-like consistency; adhesions to the surrounding structures are often present, and necrotic/hemorrhagic areas are found scattered amidst the tumor. In this situation, the resection of the neoplasm and its nerve of origin becomes mandatory, extending the resection as distally as possible from each pole of the tumor; the surrounding soft tissues may also mandate resection. Repetitive intraoperative biopsies help to assess the tumor-free boundaries to facilitate excision. This minimizes the risk of local recurrence and a metastatic spread of the malignant tumor. Functional deficits can be compensated for by distal nerve or tendon transfers during the same surgery. Histopathological evidence of malignancy requires postoperative radiotherapy; whenever available, we prefer the hadron therapy (particle or ion beam therapy) to the conventional radiotherapy. The indications for administration of chemotherapy is evaluated by the oncologist. We never give indication for disarticulation of part of a limb in order to carry out radical excision of these lesions. In every case, a diagnostic workup and meticulous follow-up visits are scheduled to detect secondary lesions. A 23-year old woman with NF1 due to the presence of de novo microdeletion presented with three superficial, bulky masses (one at the level of the right supraclavicular brachial plexus, one on the right forearm, and one on the anterior surface of the right leg) [Figure 1] and one palpable lesion in the right pectoral area, that had slowly grown since her late childhood. She was completely asymptomatic and was only concerned about her cosmetic appearance. Her MRI had not detected any malignancy. After the indication for surgery had been discussed in details with her, a radical en bloc removal of all tumors in one session was performed, 3 weeks after the initial consultation. All the tumors were capsulated and, with the sole exception of the brachial plexus neoplasm, did not origin from major nerve trunks. Her postoperative course was uneventful. On histopathological examination, only the pectoral lesion was benign; the brachial plexus tumor was identified as a low-grade MPNST, and foci of early malignant transformation were detected in the other neoplasms. Hadron therapy on the brachial plexus was further recommended. Postoperative investigations ruled out secondary lesions but revealed two deeply located, bulky lesions (one embedded in the left psoas muscle and one along the left subgluteal sciatic nerve). Although not clearly malignant (at the PET scanning, the standardized uptake value (SUV) was borderline), surgery was advised in anticipation of future malignant transformation of the lesion. Histopathology defined them both as benign lesions. At a 5-year follow-up, no recurrence or secondary lesions have occurred in the patient. A 12-year old child was referred for a giant abdominal plexiform neurofibroma extending along the left lumbosacral plexus, sciatic nerve, and disfiguring her external genitalia. 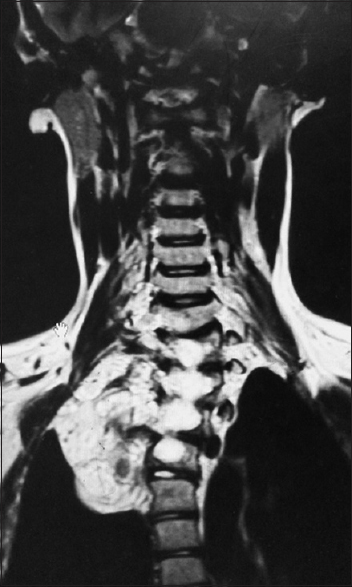 The clinical picture also included a spinal scoliosis, multiple neurofibromas along the spinal nerves and in the mediastinum. The genital disfigurement had led to the diagnosis of NF1 when she was 2 years old. It was discovered at that time that the disorder had been inherited from her mother (who was asymptomatic and thus unaware of having the condition). Due to an earlier episode of paraparesis, she had previously undergone removal of a neurofibroma that had been compressing the spinal cord. The abdominal plexiform neurofibroma had been revealed during the initial assessment and was deemed to be inoperable. Its progressive growth gradually caused bilateral ureteric stenosis (eventually requiring an external urinary drainage) and severe constipation due to bowel compression. Administration of imatinib had been attempted but had to be discontinued early due to its significant side effects, which the patient could not tolerate. The disfiguring subgluteal growth caused severe pain radiating along the lower limb, and especially worsened by compression of the limb; the girl could not sit or lie down and was even obliged to kneel at school. 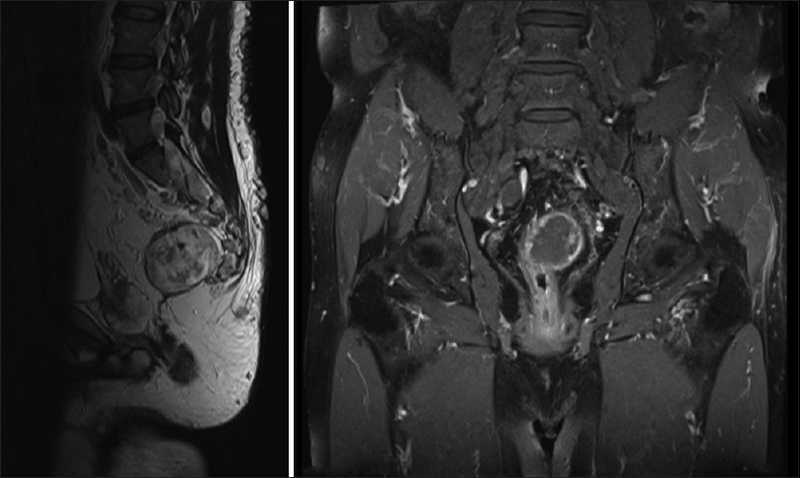 A two-staged removal of the extrapelvic plexiform tumor was considered to improve her quality of life. Removal of the subgluteal mass was performed via Henry's approach; a plastic surgeon remodeled the affected buttock. The formation of a subcutaneous hematoma (conservatively treated) resulted in wound healing by secondary intention, that had significantly slowed down her recovery; nevertheless, the ultimate outcome was satisfactory, with resolution of her pain and buttock symmetry. Before scheduling the procedure for removal of the thigh tumor, the onset of fatigue and dyspnea had also revealed malignancy in a previously existing mediastinal neurofibroma (that was further confirmed by performing a biopsy). It was deemed inoperable considering her clinical picture; only radiotherapy and chemotherapy were advised. Relentless progression of the disease eventually resulted in her death a few months later. A 45-year old lady with segmental NF1 of the right upper limb was referred for pain and ulnar paresthesias. She presented with three small tumors in the cubital tunnel and a plexiform neurofibroma in the forearm along the course of the ulnar nerve. She underwent two surgeries. 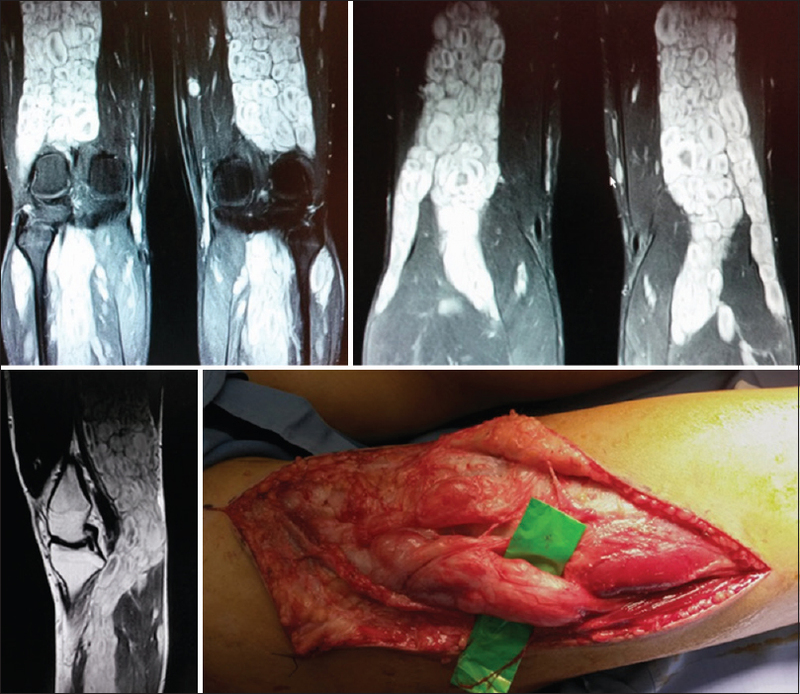 During the first procedure, two of the cubital tunnel tumors were radically removed; the third neurofibroma was only partially removed as a motor fascicle related to finger flexion lay embedded in the tiny mass. Surgery provided a remarkable subsidence of ulnar pain but paresthesias persisted. Gross debulking of the forearm plexiform tumor was performed afterwards that resulted in further subsidence of the ulnar algoparesthesias that she had been having. A 17-year old boy affected by NF1 inherited from his father, had a 2-year long history of progressive development of bilateral foot drop, sensory loss in the common peroneal nerve (CPN) territory, and severe pain due to bilateral plexiform neurofibromas, growing along the course of the sciatic nerve and its terminal branches [Figure 3]. On neurological examination, the CPN innervated-muscles showed some residual function. Although surgery was indicated, a radical tumor removal was deemed unlikely. Exploration confirmed the inoperability of the tumor while nerve stimulation detected some functional motor response in the CPN territory; only decompression of both common peroneal nerves at the fibular head was performed, resulting in immediate, complete resolution of pain and a rapid, full sensory recovery. No improvement of foot dorsiflexion was evident until after 6 months of follow-up; its restoration was successfully achieved with tibialis tendon transfers. The management of NF1 is challenging. In many Western countries, its wide spectrum of manifestations and their therapeutic implications, and the complexity involved in their treatment have resulted in the founding of multidisciplinary referral centers for their management. Unfortunately, a large number of patients with NF1 are still undiagnosed or inappropriately treated, especially when health care is not easily accessible. In particular, PNTs are frequently mismanaged; removal of symptomatic tumors is often performed by surgeons without expertise in the field. The fear of neurological complications often results in them being conservatively managed. Financial issues often limit the diagnostic assessments that may be performed in patients from countries that are without a national health care system. The prevention of malignancy and efforts to ensure its early detection are often neglected, although NF1 patients are known to present a lifetime risk of developing MPNSTs that ranges from 8%–13%., When these data are compared with the lifetime risk for the development of breast cancer in women (12% according to the American Breast Cancer Organization), the importance of surveillance and an early detection of MPNSTs in NF1 become irrefutible. The microdeletion subgroup is particularly predisposed to developing a MPNST (the lifetime risk even rises to 16%–26%), yet prevention should be enforced in the overall NF1 population. A valid tool would be to identify the patients at enhanced risk by assessing the whole body tumor burden, especially focusing on deeply located masses, and for the age group between the age range of 15 and 20 years. Although MRI remains the first-choice investigation for assessment of these patients, it is not fully reliable in detecting malignancy, as MPNSTs often share similar characteristics (e.g., the same shape, without the presence of any necrotic areas, and without infiltration into the surrounding structures) with their benign counterparts. When the histology of the lesion is suspicious, we rely on PET scans. Both in our experience and in the available literature, this investigation seems the most sensitive investigation presently available to detect possible malignancy;, in particular, atypical neurofibromas are avidly revealed on PET scans. Yet, the PET scans should not be overindicated in a cancer-prone syndrome, given the significant dose of radiation the scanning procedure implies for the patient. Once the whole tumoral burden has been estimated, the indications for treatment must be shared with the patient. In recent years, research has focused on drugs (e.g., imatinib, pirfenidone, sirolimus) aiming to control the growth, and possibly, even reduce the volume of PNTs (especially the plexiform variants). Some initial, promising trial reported even up to 20% decrease in tumor volume over a 6-month period, although this favorable result occurred in one-fourth of the patients only, and the patient cohort was insufficient to warrant the beneficial treatment in every case. However, large clinical trials have generally not proven the medical treatment to be efficacious.,,, Although it was concluded that the drugs were rather well tolerated, the percentage of serious adverse events are not negligible, and the possible consequences of long-term administration of these medications in young patients are unknown. At present, surgery undoubtedly represents the most valid preventive strategy. As NF1 patients usually harbor several PNTs and develop new lesions during their lifetime, surgical indication should be wisely selective. Removal can be safely performed; unless the lesion has been proven to be malignant, the surgeon should always aim to preserve function and not pursue a radical removal of the lesion at any cost. Although still advocated, in our opinion, the role of preoperative biopsy is redundant except in a few cases. In easily accessible lesions, ensuring a total surgical removal is a simple procedure for an experienced surgeon that provides gratifying results. Moreover, the onset of neurological deficits after a biopsy are not uncommon and specimens are often insufficient to provide a reliable histopathological assessment; in the cases who have presented with an initial malignant transformation in their bulky lesions, histopathology is burdened by a high percentage of false negatives and may actually lead to misleading in indications for treatment. We would like to conclude with a few remarks about MPNSTs. Their classification as soft tissue sarcomas is arguable due to the lack of specific morphological criteria and/or ancillary immunohistochemical or molecular tests. Therefore, the surgical strategy usually advised for sarcomas should not be blindly applied in MPNTs. When malignant forms of the lesion are not infiltrating and appear well-capsulated, there is no requirement of a wide excision of the tumor with the parent functional nerve and surrounding tissues (as would be conventionally recommended for a malignant soft tissue sarcoma), as that may result in unacceptable functional deficits. We also believe that, although still advocated, a limb amputation for infiltrative lesions should be ruled out, due to its devastating impact on the quality of life of the patient, as the procedure has not yet been proven to offer a longer survival rate than the less radical procedures. Functional reconstruction (preferably by tendon transfers, as they quickly overcome the neurological deficits) should always go hand-in-hand with the ablative surgery. Graft reconstruction is never an option; the excision of the tumor and its nerve of origin results in long gaps and postoperative radiotherapy on the affected area follows surgical removal. Literature has highlighted a poorer prognosis in MPNST associated with NF1 than in sporadic tumors; only one-third of patients are alive at a 5-year follow-up, although the survival rate has recently been reported to have improved, especially in female patients (5 year survival: 46% in female versus 22% in male patients).,,, The poor prognosis in NF1 could be explained by the fact that patients with NF1 seek medical advice later than the non-NF1 patients: the presence of a rapidly growing mass, especially when painful and associated with progressive functional impairment certainly raises a red flag for the non-NF1 patients, while the NF1 patients are usually complacent about the presence of their lumps. It must be also admitted that the medical staff members have often offered false reassurance and downplayed the risk of MPNSTs in NF1. Imparting thorough information on MPNSTs and enforcement of prevention strategies could certainly result in beneficial effects. Patients with NF1 should be thoroughly informed regarding their propensity to developing MPNSTs, urging them to regularly come for follow-up visits and seek medical advice whenever symptoms related to malignancy manifest. The NF associations should have a leading role in spreading education to their affiliated patients and families. A network of multidisciplinary referral centers is the only valid tool to provide a correct assessment and enforce preventive strategies. Surgery should be no longer be feared as it may be safely performed by surgeons with expertise in the field. The surgical results and the histopathological analysis are essential to establish a valid preventive strategy for other lesions that exist in the patient suffering from NF1. We thank Nasiba Pardaeva, our medical illustrator, for her technical assistance. We dedicate this paper to the everlasting memory of Matilde, stolen too early from our lives; her bright intelligence and incredible sweetness will always remain engrained in our heart. Von Recklinghausen F. Uber die multiplen Fibrome der Haut und ihre Beziehung zu den multiplen Neuromen. Hirschwald, Berlin, 1882. Huson SM, Compston DAS, Harper PS. A genetic study of von Recklinghausen neurofibromatosis in South East Wales. 1- Prevalence, fitness, mutation rate and effect of parental transmission on severity. J Med Gen 1989;26:704-11. Rasmussen A, Friedman JM. 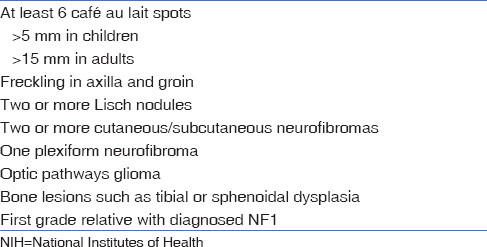 NF1 gene and neurofibromatosis 1. Am J Epidemiol 2000;151:33-40. Pasmant E, Sabbagh A, Spurlock G, Laurendeau I, Grillo E, Hamel MJ, et al. NF1 microdeletions in neurofibromatosis type 1: From genotype to phenotype. Hum Mutat 2010;31:E1506-18. De Raedt T, Maertens O, Chmara M, Brems H, Heyns I, Sciot R, et al. Somatic loss of wild type NF1 allele in neurofibromas: Comparison of NF1 microdeletion and non-microdeletion patients. Genes Chromosomes Cancer 2006;45:893-904. Kehrer-Sawatzki H, Mautner VF, Cooper DN. Emerging genotype-phenotype relationships in patients with large NF1 deletions. Hum Genet 2017;136:349-76. Rodriguez FJ, Folpe AL, Giannini C, Perry A. Pathology of peripheral nerve sheath tumors: Diagnostic overview and update on selected diagnostic problems. Acta Neuropathol 2012;123:295-319. Evans DG, Huson SM, Birch JM. Malignant peripheral nerve sheath tumours in inherited diseases. Clin Sarcoma Res 2012;2:17. King AA, Debaun MR, Riccardi VM, Gutmann DH. Malignant peripheral nerve sheath tumors in neurofibromatosis 1. Am J Med Genet 2000;93:388-92. Evans DG, Baser ME, McGaughran J, Sharif S, Howard E, Moran A. Malignant peripheral nerve sheath tumours in neurofibromatosis 1. J Med Genet 2002;39:311-4. Nguyen R, Dombi E, Widemann BC, Solomon J, Fuensterer C, Kluwe L, et al. Growth dynamics of plexiform neurofibromas: A retrospective cohort study of 201 patients with neurofibromatosis 1. Orphanet J Rare Dis 2012;7:75. Hyodo T, Sugawara Y, Sakayama K, Kito K. Early-stage malignant peripheral nerve sheath tumour arising from a solitary neurofibroma. Br J Radiol 2012;85:e026-30. Vasconcelos RAT, Coscarelli PG, Alvarenga RP, Acioly MA. Malignant peripheral nerve sheath tumor with and without neurofibromatosis type 1. Arq Neuropsiquiatr 2017;75:366-71. Ducatmann B, Scheithauer B. Post-irradiation neurofibrosarcoma. Cancer 1983;51:1028-33. Ducatmann B., Scheithauer B, Piepgras DG, Reiman HM, Ilstrup DM. Malignant peripheral nerve sheath tumors: A clinicopathological study of 120 patients. Cancer 1986;57:2006-21. Foley KM, Woodruff JM, Ellis FT, Posner JB. Radiation-induced malignant and atypical peripheral nerve sheath tumors. Ann Neurol 1980;7:311-8. Higham CS, Dombi E, Rogiers A, Bhaumik S, Pans S, Connor SE, et al. The characteristics of 76 atypical neurofibromas as precursors to neurofibromatosis 1 associated malignant peripheral nerve sheath tumors. Neuro Oncol 2018;20:818-25. Miettinen MM, Antonescu CR, Fletcher CDM, Kim A, Lazar AJ, Quezado MM, et al. Histopathologic evaluation of atypical neurofibromatous tumors and their transformation into malignant peripheral nerve sheath tumor in patients with neurofibromatosis 1-a consensus overview. Hum Pathol 2017;67:1-10. Sordillo PP, Helson L, Hajdu SI. Malignant schwannoma-clinical characteristics, survival, and response to therapy. Cancer 1981;47:2503-9. McCaughan JA, Holloway SM, Davidson R, Lam WW. Further evidence of the increased risk for malignant peripheral nerve sheath tumour from a Scottish cohort of patients with neurofibromatosis type 1. J Med Genet 2007;44:463-6. De Raedt T, Brems H, Wolkenstein P, Vidaud D, Pilotti S, Perrone F, et al. Elevated risk for MPNST in NF1 microdeletion patients. Am J Hum Genet 2003;72:1288-92. Ferner RE, Golding JF, Smith M, Calonje E, Jan W, Sanjayanathan V, et al. 2-fluoro-2-deoxy-D-glucose positron emission tomography (FDG PET) as a diagnostic tool for neurofibromatosis 1 (NF1) associated malignant peripheral nerve sheath tumours (MPNSTs): A long term clinical study. Ann Oncol 2008;19:390-4. Toymassian D, Razab AR, London K. The role of [18F] FDG-Pet/CT in predicting malignant transformation of plexiform neurofibromas in neurofibromatosis -1. Int J Surg Oncol 2016;2016:6162182. doi: 10.1155/2016/6162182. Robertson KA, Nalepa G, Yang FC, Bowers DC, Ho CY, Hutchins GD, et al. Imatinib mesylate for plexiform neurofibromas in patients with neurofibromatosis type 1: A phase 2 trial. Lancet Oncol 2012;13:1218-24. Widemann BC, Babovic-Vuksanovic D, Dombi E, Wolters PL, Goldman S, Martin S et al. Phase II trial of pirfenidone in children and young adults with neurofibromatosis type 1 and progressive plexiform neurofibromas. Pediatr Blood Cancer 2014;61:1598-602. Widemann BC, Dombi E, Gillespie A, Wolters PL, Belasco J, Goldman S, et al. Phase 2 randomized, flexible crossover, double-blinded, placebo-controlled trial of the farnesyltransferase inhibitor tipifarnib in children and young adults with neurofibromatosis type 1 and progressive plexiform neurofibromas. Neuro Oncol 2014;16:707-18. Weiss B, Widemann BC, Wolters P, Dombi E, Vinks A, Cantor A, et al. Sirolimus for progressive neurofibromatosis type 1-associated plexiform neurofibromas: A Neurofibromatosis Clinical Trials Consortium phase II study. Neuro Oncol 2015;17:596-603. Weiss B, Widemann BC, Wolters P, Dombi E, Vinks AA, Cantor A, et al. Sirolimus for non-progressive NF1-associated plexiform neurofibromas: An NF clinical trials consortium phase II study. Pediatr Blood Cancer 2014;61:982-6. Kar M, Deo SVS, Shukla NK, Malik A, Gupta SD, Mohanti BK, et al. Malignant peripheral nerve sheath tumors (MPNST)- Clinic-pathological study and treatment outcome of twenty-four cases. World J Surg Oncol 2006;4:55. Gortz O, Langer S, uthoff D, Ring A, Strcker I, Tannapfel A, et al. Diagnosis, treatment and survival of 65 patients with malignant peripheral nerve sheath tumors. Anticancer Res 2014;34:777-84. Dunn GP, Spiliopoulos K, Plotkin SR, Hornicek FJ, Harmon DC, Delaney TF, et al. Role of resection of malignant peripheral nerve sheath tumors in patients with neurofibromatosis type 1. J Neurosurg 2013;118:142-8. Kahn J. Gillespie A, Tsokos M, Ondos J, Dombi E, Camphausen K, et al. Radiation therapy in management of sporadic and neurofibromatosis type 1-associated malignant peripheral nerve sheath tumors. Front Oncol 2014;4:324. Keole S, Ashman JB, Daniels TB. Proton therapy for sarcomas. Cancer J 2014;20:409-14. Zehou O, Fabre E, Zelek L, Sbidian E, Ortonne N, Banu E, et al. Chemotherapy for the treatment of malignant peripheral nerve sheath tumors in neurofibromatosis 1: A 10-year institutional review. Orphanet J Rare Dis 2013;8:127. Ingham S, Huson SM, Moran A, Wylie J, Leahy M, Evans DG. Malignant peripheral nerve sheath tumours in NF1: Improved survival in women and in recent years. Eur J Cancer 2011;47:2723-8.